I picked it up, of course, because Sky had selected The Jungle Books for our October read for the Reading to Know Book Club. I had never read these books before and have been looking forward to it. Like many of you, I have been schooled on the Disney version of The Jungle Book and Kipling had to come along and unschool me. (Sigh.) Reading the book is a vastly differently experience than watching the movie, although the characters have the same names and the situations are somewhat familiar. This should probably not surprise me but in several respects it did. What you'll find in this book instead are characters who are very attached to The Jungle Law. Mowgli is (as in the movie version) just a wee babe when he is delivered to a wolf family for rearing in the jungle. He grows up learning how to be an animal - how to hunt like one and speak like one - so as to avoid the death which is all around him. As he grows he proves to be strong, wise, and very brave, eventually becoming the Master of the Jungle. However, as also happens in the movie, he does find himself drawn towards the "man village" although he is older in the book than in the movie when this happens. Kipling is an interesting read. You can tell he understands people and emotion, but I found him rather dry in spots all the same. 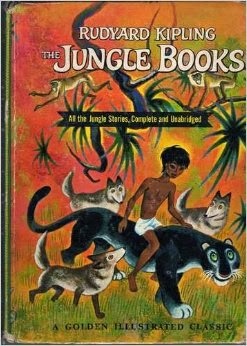 I read the first Jungle Book (the Mowgli stories) and was enraptured by the character's moral code of how and when to kill, the need to pay a blood price and retribution for sins. All very interesting. Upon completing the first book, I moved on to the second. I enjoyed the story of Rikki Tikki Tavi and after that the book took a nose dive as far as I was concerned. I found I couldn't concentrate on his shorter stories either because I wasn't interested by the characters or the direction of the story. Interestingly enough, Kipling was apparently noted for being an innovator of the art of telling a short story. That said, trying to work my way through the second Jungle Book has been slowly killing off my desire to read (period) and so I finally resolved to stop reading and call it good. Now I'm finding it interesting to browse online info about Kipling himself. The following information I found to be quite fascinating: although Kipling was born in India and was raised between India and England, he and his wife landed in America for the first part of their married life. Apparently, after marrying in England the couple decided to honeymoon in America and Japan. They went first to American and traveled on to Japan where they discovered that their bank had failed. Instead of returning to England, the couple moved to Vermont and settled down in a little home which they named "Bliss Cottage". They eventually established themselves in this new country and moved into a different, larger home which they are reported to have loved. It was while they couple lived in Vermont that their two daughters were born - as well as The Jungle Book. Due to political and family circumstances, the family felt forced to return to England and spent the rest of their lives based there. Anyway, I'm very glad that Sky chose to read this for many reasons, nonetheleast of which is that it crossed one more book off of my personal Disney Reading "Challenge". I didn't read it this time - maybe some day. 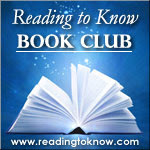 Is it a book you could read with kids, or do you think it's better for older ones? I may put it in the "maybe when I have grandkids" TBR list. I had wondered how it differed from the Disney version. A bear does seem better as a silly animal than a big cat - but maybe I think that way just because that is what I am used to. I think I've always liked the idea of Kipling more than I've actually liked Kipling. His books have never done much for me. I love most of Kipling's stuff, he is a breath of "real" to me. Barbara H., I would read it with older children. It's a bit realistic when talking about death, killing etc.